I started writing this the day after I got back from Amsterdam where I was speaking at the brilliant CSS Day conference. I learned a lot, I met some amazing people and I did a talk on interactive email, which can be scary in front of a few hundred web developers (who notoriously hate writing email code) but it went down really well. Out of all the things I learned at the conference, one thing really stuck with me, accessibility. Léonie Watson did a great talk on the subject, I also had a chat with her in the bar afterwards about accessibility in email and the lack there of. Not everyone can easily use a monitor, keyboard or mouse, some people use what's classed as 'assistive technology'. For example people with visual disabilities may use screen reader software to read the text on the screen, or a magnifier to dramatically enlarge it. People with physical disabilities may have to navigate using alternative input devices such as joysticks, eye tracking, a sip 'n' puff device or specialist keyboards. Accessibility in email is simply about building emails in a way that can be accessed by these assistive technologies, allowing more people to access the content being sent. You're probably already writing code so people using Outlook, Gmail and other clients with poor rendering can read your emails, think of this as an extension of that. It's just increasing support to get your message to more users. 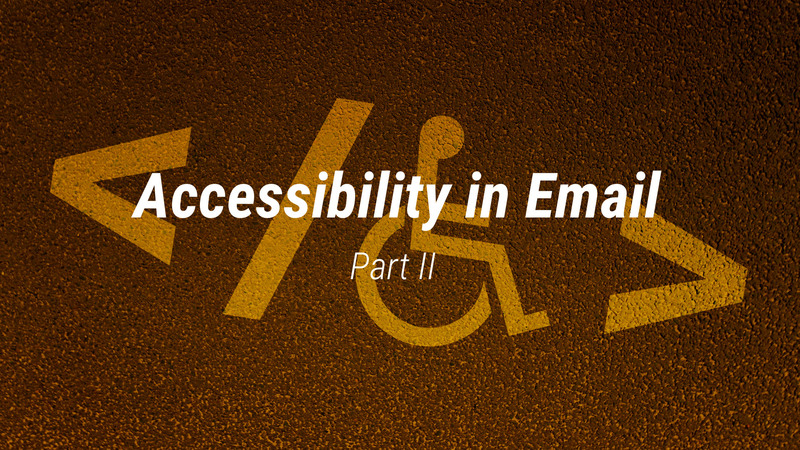 Email accessibility is bad because of two factors. Email developers not writing accessible code and email clients not supporting accessible code. I often spend my days working out better ways to write email code so now I'm focusing my attention on making that code accessible too. Once the code is built and being sent it'll hopefully be easier to convince the email clients they need to catch up too. I will then share my findings and encourage others to do the same.